Secretary-General Ban Ki-moon speaks at the opening ceremony of the World Future Energy Summit 2012 in Abu Dhabi, United Arab Emirates. As the International Year of Sustainable Energy for All kicked off today, United Nations officials called on governments, the private sector and civil society to help expand energy access, improve efficiency and increase the use of renewables. Globally, one person in five still lacks access to modern electricity and twice that number – three billion people – rely on wood, coal, charcoal, or animal waste for cooking and heating. “We are here to build a new energy future… a future that harnesses the power of technology and innovation in the service of people and the planet,” Mr. Ban said in remarks to the opening of the World Future Energy Summit, which is taking place in Abu Dhabi, United Arab Emirates. “Sustainable energy for all is within our reach,” he told the summit, which also serves as the global launch of 2012 as the International Year. Mr. Ban stressed that energy is central to everything, from powering economies to achieving the anti-poverty targets known as the Millennium Development Goals (MDGs), from combating climate change to underpinning global security. To do this, he cited the need to scale up successful examples of clean energy and energy-efficient technologies; innovation that can spread throughout the developing world; partnerships with the private sector; and visionary leadership. Mr. Ban stressed that energy poverty cannot be allowed to jeopardize progress towards the MDGs – targets aimed at slashing global poverty by 2015 by combating hunger, disease, illiteracy, environment degradation and discrimination against women. To generate action to reduce energy poverty, catalyze sustainable economic growth and mitigate the risks of climate change, the Secretary-General last year set up a high-level group. The group is tasked with promoting his Sustainable Energy for All initiative, which seeks to ensure universal access to modern energy services, double the rate of improvement in energy efficiency and double the share of renewable energy in the global energy mix, all by 2030. Also addressing the opening of the summit, General Assembly President Nassir Abdulaziz Al-Nasser stressed that there is a more urgent need to ensure the sustainable use of energy today than at any time in the past, given that more than a billion people continue to live without access to electricity. “The provision of sufficient and low-cost energy is unquestionably an essential component of efforts to alleviate poverty, improve the well-being of mankind, raise living standards and achieve sustainable development,” he stated. “While international efforts to meet the challenges of development at the global level are continuing, it is increasingly being acknowledged that the provision of sufficient energy is having an increased impact on food security, health, education, transport, communications, water and sanitation. “Energy has, therefore, become an important constituent, if not an essential means, of achieving the Millennium Development Goals,” stated Mr. Al-Nasser. He added that by declaring 2012 as the International Year of Energy for All, the Assembly established a key platform from which to raise awareness in the international community of the importance of addressing energy issues, finding ways to develop the renewable energy sector, and promoting efficient energy and water use and waste management. “As part of the International Year, which officially begins today, it is incumbent upon Member States and international organizations to take initiatives that are designed to create an environment that will foster access to energy and energy-related services and the use of new and renewable energy technologies,” he stated. Also today, the Secretary-General met separately with President Olafur Ragnar Grimsson of Iceland, Prime Minister Wen Jiabao of China and Prime Minister Kim Hwang-sik of the Republic of Korea, as well as Sheikh Mohammed Bin Zayed Al Nahyan, Crown Prince of Abu Dhabi, and Sheikh Abdullah Bin Zayed Al Nahyan, Foreign Minister of the United Arab Emirates (UAE). The Assembly President also held a meeting with the Foreign Minister of UAE. 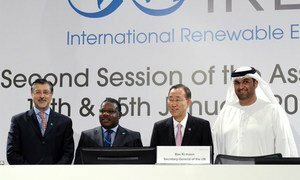 Secretary-General Ban Ki-moon on Sunday called on participants at a forum in Abu Dhabi to help advance the goal of a clean energy future for all, stressing the advantages of renewables for communities, for economic growth and for the planet.